The Thing took its name from a piece by Don Cherry: when they first got together it was to play his music. So it does make sense that they should eventually team up with Don Cherry's daughter. 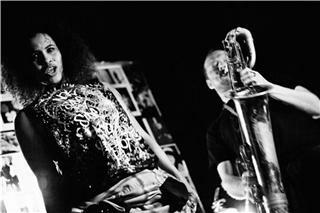 Neneh Cherry & The Thing met for the first time at a recording session in London in the fall of 2010. It clicked right away as they all shared an open, free approach to the music. The high energy of The Thing's playing found a fitting counterpart in Neneh's intense style. After a performance at Strand, Stockholm in March 2011, they decided to continue the collaboration resulting in their forthcoming, self-titled album, The Cherry Thing, out June 19 on Smalltown Supersound, and an upcoming tour of European music festivals. Apart from their own compositions, the album features the music of such diverse artists as Ornette Coleman, Suicide, Don Cherry, Martina Topley-Bird, The Stooges, and MF Doom. A born pioneer, Neneh Cherry fits naturally into the forefront of musical and social change, whether it's post-punk, rap, or giving the music world a new image of female pop stars: famously, she promoted her breakthrough solo album Raw Like Sushi by getting down on British TV wearing a tight outfit while seven months pregnant. Breakthroughs mark Cherry's career, full of individual choices like collaborating with Senegal's Youssou N'Dour on "7 Seconds" which reached number 1 in 48 countries and was voted "Song of the Century" by the French public in 2000. Her next release, the torch song "Woman," was sung in English and Spanish and consolidated Neneh's respect as a conscious global role model for women and those that appreciate them. Sticking to your artistic guns is the code with which Neneh was raised. Her adaptive approach was molded growing up on the road with her Swedish artist mother Moki and her step-father, world/free jazz trumpet great Don Cherry. Summers were spent in the Swedish forests; with Don's folks in Watts, L.A; the family loft in New York or with the family of her percussionist father, Amadu Jah, in Sierra Leone. Those formative influences and experiences prepared Neneh for a lifetime of creating with talents as different as they are authentic. Starting out by joining key punk girl band The Slits, Neneh next became the voice of the renegade free-blowing post-punk Rip, Rig and Panic and their successor: Float Up, C.P. After attracting further attention with her vocals on The The's classic "Slow Train To Dawn," Neneh became part of Buffalo, the creative collective assembled by the late visionary Ray Petri, whose style so shaped the 1980s. Now a solo artist, Cherry hit it big straight away with the worldwide hit singles "Buffalo Stance," "Manchild" and "Inna City Mamma" from her debut album Raw Like Sushi. More followed, like "Buddy X" from the Homebrew and Man albums, which also featured "Woman" and "7 Seconds." After the Man album Neneh decided to step off the corporate music business tread mill preferring to collaborate with artists such as Tricky, Damon Albarn/Gorillaz and her own family collective, cirKus. The Thing was established in the spring of 2000 when Mats Gustafsson, Ingebrigt Hker Flaten, and Paal Nilssen-Love met to play several concerts and to record their first CD on the Crazy Wisdom label (brain child of Swedish left field pioneer Conny Lindstrm). In 2001 they recorded another CD on the same label as a quartet with Joe McPhee. The trio was a long wanted constellation where several musical styles meet in a very high energetic outlet. All members are influenced by different traditions of free music derived from Germany, England and the US, and these influences are to be felt, not necessarily heard. When the trio started out the book contained mainly tunes by Don Cherry. Since Joe McPhee`s participation, the Thing's repertoire has included other free jazz standards by David Murray, Frank Lowe and Norman Howard. Also, the group's enthusiasm towards rock music is heard when they play "To Bring You My Love" by PJ Harvey on the second CD. Today the book has expanded to include tunes by The White Stripes, The Sonics and Yeah Yeah Yeahs. These are just examples to show how little distinct musical styles are today, how similar the energy can be, and how much today's audience is melted together, devoted to creative music. The Thing has performed with guests like Joe McPhee, Ken Vandermark, Otomo Yoshihide, Jim O'Rourke and Thurston Moore. The Thing is now signed to Smalltown Supersound. Mats Gustafsson is one of Europe's biggest names on the free music scene. Through groups like Gush, AALY trio and Peter Brtzmann`s Chicago Tentet he has established himself as a very powerful saxophonist who has somewhat reinvented the way of playing the saxophone. In 2011 he received the Nordic Council Music Price: the biggest price for a musician in the Nordic countries. Ingebrigt Hker Flaten and Paal Nilssen-Love have become known as Norway`s heaviest rhythm-section. Since their long-time collaboration started in 1992, they have been working together in several groups like School Days with Ken Vandermark, Scorch Trio with Raoul Bjrkenheim, and the Swedish/Norwegian jazz-group Atomic.